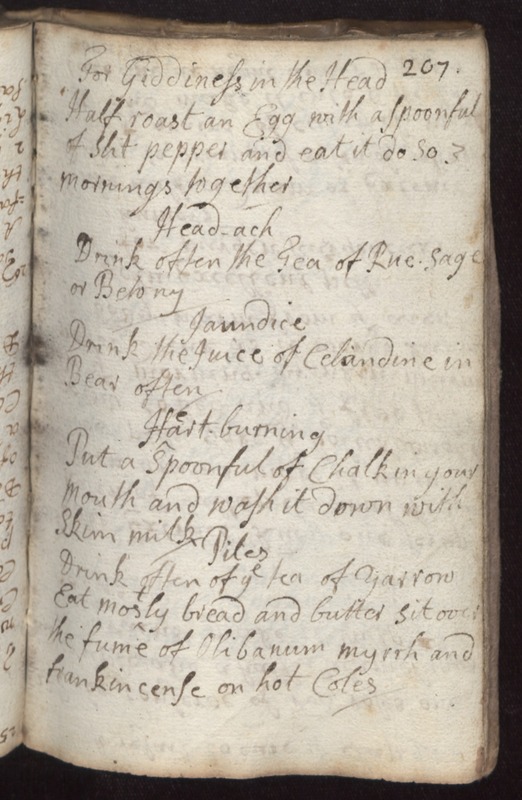 For Giddiness in the Head 207 Half roast an Egg with a Spoonful of slit pepper and eat it do so 3 mornings together Head-ach Drink often the Tea of Rue, Sage or Betony. Jaundice Drink the Juice of Celandine in Bear often. Heart burning Put a spoonful of Chalk in your mouth and wash it down with skim milk. [Pites?] Drink often of ye tea of Yarrow Eat mostly bread and butter sit over the fume of Olibanum myrrh and frankinsense on hot Coles.